I’m always up for a new adventure, something we’ve never done. When I saw that Pigeon Forge had an indoor skydiving attraction, I was totally game for it. 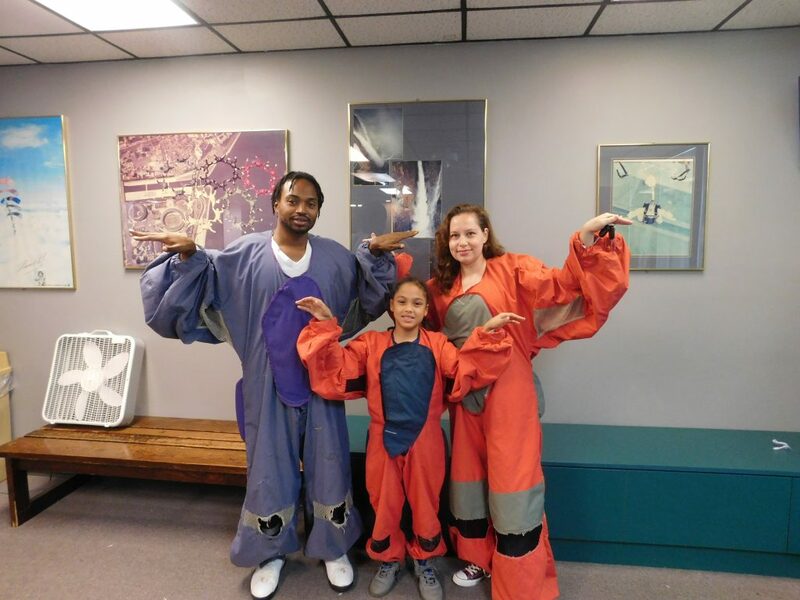 Flyaway Indoor Skydiving provides a fun, family friendly adventure that will take you to higher heights without actually leaving the ground. Somethings you want to know before you go; wear gym shoes, bring a hair tie, wear shorts or pants. They do have shoes on site, but wearing shoes after someone else isn’t something that I personally want to do. My hair was tangled once we finished, so don’t say I didn’t tell you. You want to dress comfortable, you will be wearing a suit, but you still want to feel comfortable will do the activity. Expect to spend an hour here. You’ll watch a short video and one of their experienced flyers will go over rules, tips and tricks before you set foot in the tunnel. This will take about 15-minutes. Next you’ll get on all your equipment; suit, goggles, helmet, gloves and ear plugs. Once everyone is set to go, you’ll enter the tunnel. Unfortunately I couldn’t take my camera in the tunnel for obvious reasons. I was hoping that I was going to get some shots of my family but that is was a no-go. If you’re experiencing this with family and friends know that you won’t be able to capture it unless someone stays out of the tunnel or you purchase a video that Flyaway records (it was less than $30). The tunnel is about 3 floors high, you’ll enter with other fellow flyers and your instructor. Each flyer will have about 3-minutes to fly each. The 3-minutes is actually broken up to about 1-minute increments, with it rotating among the flyers. My son went first since he was the smallest, then another young boy and so on and so forth. There is a weight limit, of which they will weigh you when you arrive. The instructor will be right there beside you, unless you’re experienced then they’ll back off depending on your experience. For all the flyers in my crew, it was everyone’s first time. After you fly you can stay behind and watch the flyers. Some of the staff went in the tunnel after we were finished so we stayed behind to watch them for a few minutes. It was very exhilarating and a lot of fun. Everyone loved it and we all said we would do it again. A great attraction to visit while you’re in Pigeon Forge. Different from the rest that will leave a lasting impression. 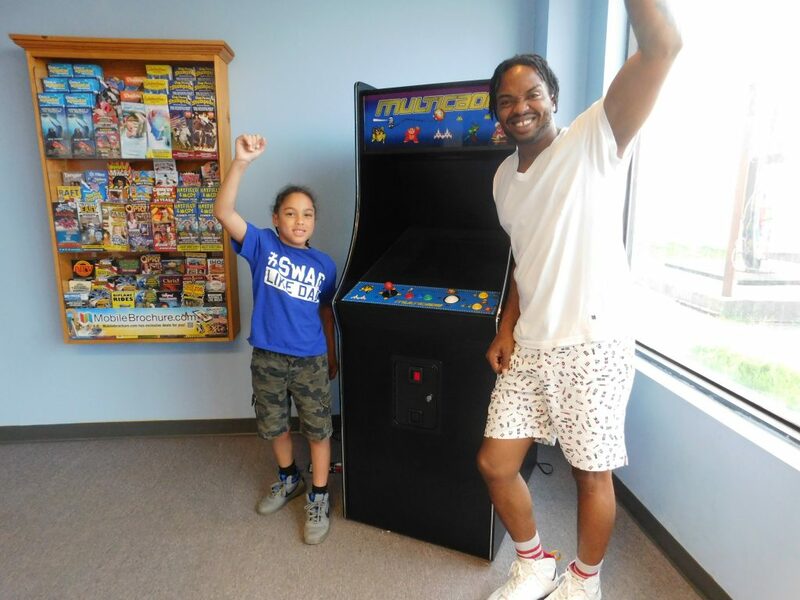 Here is a shot of my two guys keeping it classy by the retro video game. 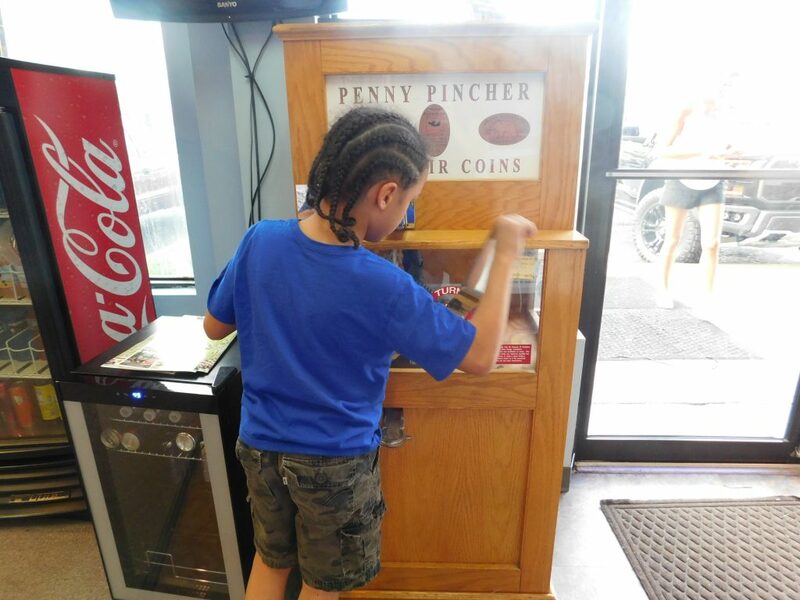 You can get a souvenir penny while you’re there, an inexpensive way to remember the visit at Flyaway Indoor Skydiving. Four attractions for one Price!